Outsourcing is nothing new, but recent outsourcing is different, both in the nature of the activities we're outsourcing, and where the sources are. No longer do we outsource only manufacturing; no longer are the source countries all industrial powerhouses. Today we're outsourcing thought work, too, and the source countries — India, the countries of the former Soviet Union, and Eastern Europe, for the most part — have large numbers of people who can think. Apples and Oranges, by Paul Cézanne (1839-1906). Oil on Canvas, ca. 1899. The painting is at the Musée d'Orsay. 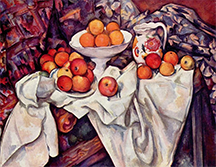 The idiom, "apples and oranges," is an expression used to remark that some things are so different that they cannot be compared one to the other. Comparing domestic and offshore labor costs is like comparing apples and oranges. Outsourcing now threatens the jobs of engineers, scientists, doctors, technicians, and decision-makers — people who are much closer in demographic type to the people who make the outsourcing decision. As decision makers, we're now outsourcing the jobs of one another's friends and relatives. Since what we're doing might have a direct and negative impact on our lives, it pays to examine it more closely than most of us have done so far. Here are just a few issues that any outsourcing plan should address. People whose jobs haven't been outsourced might believe that they haven't been outsourced yet. Since the brightest of these always have alternatives, they might depart preemptively, and you could end up losing people whose jobs you had no intention of eliminating. Retention costs money, and losing good people costs even more. How much? If your supplier develops an innovation or acquires an insight, will you ever become aware of it? Can that innovation or insight propagate to your competitors? If it did, in violation of your contract, how would you know? Cultural and language differences, and less effective person-to-person relationships, can lead to increased incidence of miscommunications. Although both parties to a communication might feel that they understand, they often have strikingly different understandings. Colossal errors are possible. How often will they happen? How much will they cost? Healthy in-house teams can deliver results more quickly than outside vendors can. For instance, when the vendor resides in a time zone 10 to 12 hours away, a typical round trip communication by voicemail or email can take a day or more. What's the cost of these and the dozens of other similar delay phenomena? What's the cost of a six-month extension of time-to-market? Suppliers provide lower prices not only through lower wages, but also by spreading costs across multiple clients. As they gather more clients, the heterogeneity of their client base increases. Unless the supplier can encourage technology homogeneity among its clients, sharing costs becomes more difficult. Could you be compelled to upgrade systems against your will? What would be the cost of forced progress? Much is available in the business press about outsourcing and offshoring. A recent accessible example is by Scott Thurm: "Lesson in India: Not Every Job Translates Overseas," The Wall Street Journal, March 3, 2004, p A1. For an overview of some novel retention tactics, see "Retention," Point Lookout for February 7, 2007. Would you like to see your comments posted here? rbrenIQrYTpxtfMGCckxsner@ChacCmlAXJlxNSHlKqhooCanyon.comSend me your comments by email, or by Web form. I offer email and telephone coaching at both corporate and individual rates. Contact Rick for details at rbrendQIaeRgYHQwaWVAoner@ChacaZTnMkqofMKhgoGIoCanyon.com or (650) 787-6475, or toll-free in the continental US at (866) 378-5470.